Cincinnati, OH - What a joyous time of the year, as we emerge from the depths of the dark and cold and are rejuvenated with the coming of spring; the blossoming flowers, budding trees, warm weather, the whole earth comes alive again from a state of dormancy. After months of harsh winter weather, the past few weeks have brought about the change in the seasons, which is fitting as our Lenten period progressed up to Holy Week and finally culminated in Pascha. It seems only fitting that the whole creation would proclaim the Resurrection of our Lord and Savior Jesus Christ! Across the world, the Lenten period is a very busy time for Orthodox Christians, especially during Holy Week. Services were held at St. George on Great Thursday, Great Friday, and Great Saturday leading up to the Paschal Celebration on Sunday. The entire Lenten period was a time for self-reflection, a time to simplify our lives by focusing on fasting and prayer, and to contemplate what our Savior went through during the last week before His Crucifixion. 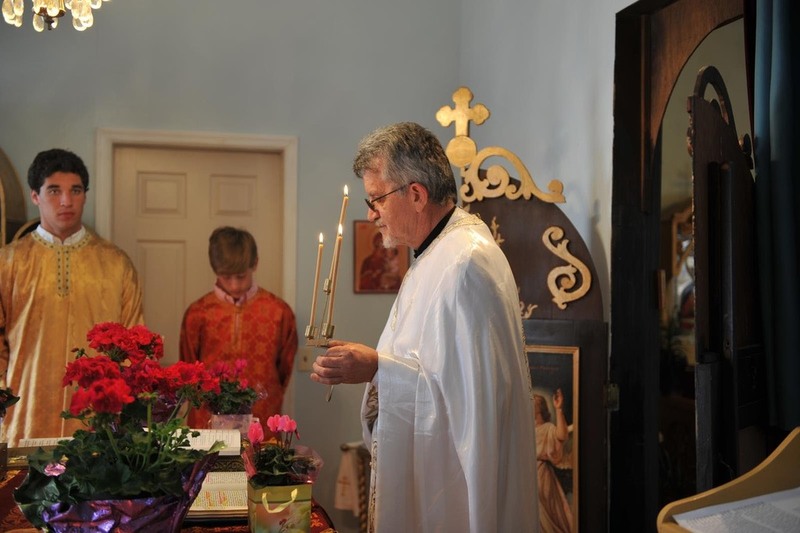 On Sunday, the faithful of St. George Serbian Orthodox Church filled the nave of the Church to capacity, with members overflowing the narthex and out into the front of the Church to celebrate the Resurrection of Christ! Father Petar, assisted in the altar by acolytes Thompson Brothers, Thomas Frazer, Veljko Uverici, and Adam Meador, celebrated the Paschal Divine Liturgy with many communicants coming to receive the Body and Blood in the form of the Eucharist. Leagsaidh Frazer read the apostle reading, while the choir, led by long-time parishioner Nancy Helbich, sang beautifully as some of our out-of-town parishioners came to sing and celebrate with us. The Heavens truly rejoiced to see so many of our families with children coming to take part in this most special day! 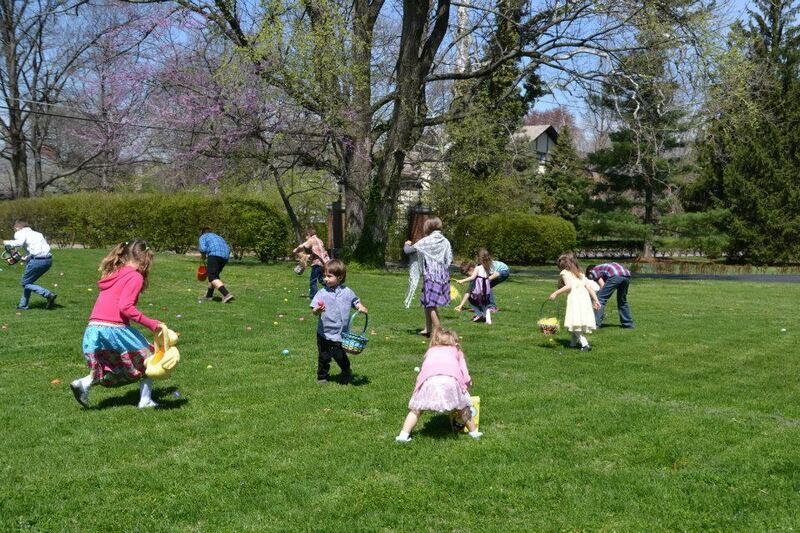 Following the Paschal Service, our children took part in an egg hunt in front of the parish. There were so many smiling faces to be seen on such a sunny, beautiful day – and not just from the children, but the parents and grandparents as well! Thank you to the volunteers who helped hide the eggs and watch over the little ones – may God bless you! Afterwards, the faithful of St. George gathered into the fellowship hall for a splendid lunch prepared by Mirko, Djuka, and the Šebez family. After many weeks of fasting, the Šebez family demonstrated wonderfully on how breaking the fast is to be done – with delicious sarme, pig roast, and all the trimmings and dessert one could want! Thank you very much for your stewardship in taking on this huge endeavor and may God bless the Sebez family! Also, thank you to Joe and Rada Carfora and children Arianna and Nicole for taking up the stewardship role of being the sponsor for next year’s Paschal Celebration! May God bless you all as well! Pascha 2014 was a huge success, as it always is. We recorded great attendance and donations, but more importantly, we were able to come together in good health to worship and celebrate Christ trampling down death by death! Let us remember those who could not attend due to poor health and may God bless them! A special thanks to the ladies of KSS who came to clean and prepare the fellowship hall and the sanctuary. Also, thank you to Protinica Gordana and Saša Krsmanović for their labor in painting and cleaning the refreshment area - it looks wonderful! May we not forget what Christ did for us, with His Death and Resurrection, as we now move on from Pascha into the days leading up to the Ascension and Pentecost. Let us remember that we celebrate the Resurrection each and every Sunday in the form of the Divine Liturgy and the Holy Eucharist and that we should make an effort to attend services more frequently. Let us set the standard for our children and loved ones, that above all things in our lives – our jobs, status, education, sports, hobbies, etc. – that we are Orthodox Christians and this is what defines us. This is what sets us apart from the rest of the world! As a convert to Orthodoxy, I discovered later in my life the beauty of Orthodoxy, but my dear Serbian brothers and sisters, God has granted the Serbs this beauty long ago! Do not let it be diminished by the secular things of this country and this world! Do not let your children casually experience this beauty, but let us guide them in embracing this and carry the light of Orthodoxy to all those whom we encounter in our daily lives! May God bless us all and give us the strength and patience to do these things! ВАИСТИНУ ВАСКРСЕ! INDEED HE IS RISEN! VOISTINU VOSKRESE! ADEVĂRAT A ÎNVIAT!